Just as appearance, atmosphere, and service are important to deliver to your customers, convenience and efficiency is essential for your staff. Having the perfect commercial ice storage units can greatly help with these things. A commercial ice bin, chest, or caddy is essential in any business setting, from restaurants, bars, and hotels, to convenience stores and schools, to catering companies and healthcare facilities. If you run a commercial establishment and go through large quantities of ice every day, you can keep it fresh and sanitary with ice storage bins from CKitchen. We carry a great selection of commercial ice storage products to undoubtedly make the storage and transportation of ice easier for you and your staff. The units we offer range from compact, versatile ice bins to ice carts with rolling baskets, to wooden ice chests that are beautifully finished for the bar, buffet or event venue. Every product allows you to store all the ice you need with convenient portability to streamline food storage, beverage preparation, and more. 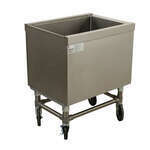 Some commercial ice bins and chests are insulated to make ice storage and transport even more convenient! 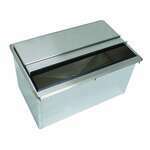 A commercial ice storage box also protects your ice from bacteria and other unsanitary elements. If you’ve partnered with CKitchen for your commercial restaurant equipment before, then you already know that we have the best selection and the best prices. The same goes for our commercial ice bins and chests. The primary element that sets one apart from another is the volume capacity that each one has. Smaller ice bins may hold about 200 pounds of ice at a time, while larger styles can accommodate as much as 1,200 pounds and usually have multiple bays for roll-under carts. Larger and more deluxe styles may also integrate with your commercial ice maker. With best-selling manufacturers like Scotsman, Lakeside, Manitowoc, Maxx Cold, and Hoshizaki, CKitchen is your best bet for top-tier commercial ice equipment. 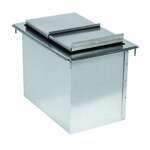 Shop our selection of Commercial Ice Bins and Chests for the guaranteed lowest prices and fast shipping. Our top priority here at CKitchen is to provide each and every one of our customers with the best customer service, as well as high performing, efficient, dependable products. If you need help choosing the right ice bin or chest for your needs, please give us a call and one of our certified food service equipment assistants will be happy to assist you.